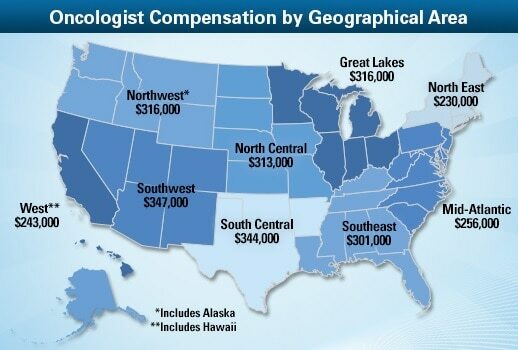 Nearly 22,000 physicians across 25 specialty areas participated in Medscape’s third physician compensation report. Data collected among oncologists surveyed found that oncology was the 10th highest ranked specialty, with a mean income of $278,000 (click here to view the average income by specialty). Orthopedics ($405,000), Cardiology ($357,000), Radiology ($349,000), Gastroenterology ($342,000), Urology ($340,000), Anesthesiology ($337,000), Plastic Surgery ($317,000), Dermatology ($306,000), and General Surgery ($279,000) ranked above Oncology. Ten percent of oncologists earn $500,000 per year or more, and 14% earn $100,000 per year or less. From 2011-2012, 46% of oncologists said that their compensation remained the same. A significant pay gap continues to exist between full-time male and female physicians. Men earned $293,000 on average, compared to $240,000 for women. 51% of oncologists would choose medicine as a career if they had to do it all over, while 57% would choose the same specialty. The largest percentage of oncologists (25%) spends 30 to 40 hours per week seeing patients. 25% of oncologists see between 25 and 49 patients per week, and 26% of oncologists see between 50 and 75 patients per week. Due to the nature of the specialty, oncologists spend a considerable amount of time with each patient: 32% spend a mean of 17-20 minutes with each patient, and 27% see patients 21 minutes or longer. 32% of oncologists spend 10-14 hours a week on paperwork and administrative activity (24% spend 5 to 9 hours). 38% say the gratitude and relationships with patients are the most rewarding part of the job, while 28% say being very good at what I do/finding answers, diagnoses.